When most of us think of pigeon fanciers, what comes to mind are the dusky rooftops of Brooklyn and maybe movies from the 1950s. How many of us think of Queen Elizabeth. Not many! We think of the Queen being followed by a chorus of corgies wherever she goes. We think of her and her thoroughbreds at the racetrack. When a favored corgi or horse dies, it makes the nightly news. Not so much with her pigeons. However, the Queen is a true pigeon fancier and has maintained a large flock—upwards of 200 pigeons—at Sandringham for all of her life. She is not the first pigeon racer amongst British royals. Her great-grandfather, Edward VII, and her grandfather, George V, were avid racers. The family’s interest in the sport dates back to 1886 when King Leopold II of the Belgians gave racing pigeons to the Royal Family. Pigeons from the Royal Lofts joined the hundreds of thousands of pigeons used by the British forces to carry messages in both World War I and II. Some were even decorated for their achievements. When not fighting for their country, the Royal pigeons spend their time at Sandringham in the new lofts completed for them in 2015, preparing for the racing season. The season runs from April to September. If you want to try to spot one: Royal pigeons wear the Queen’s cipher around their leg and travel in boxes bearing the Royal Crest. 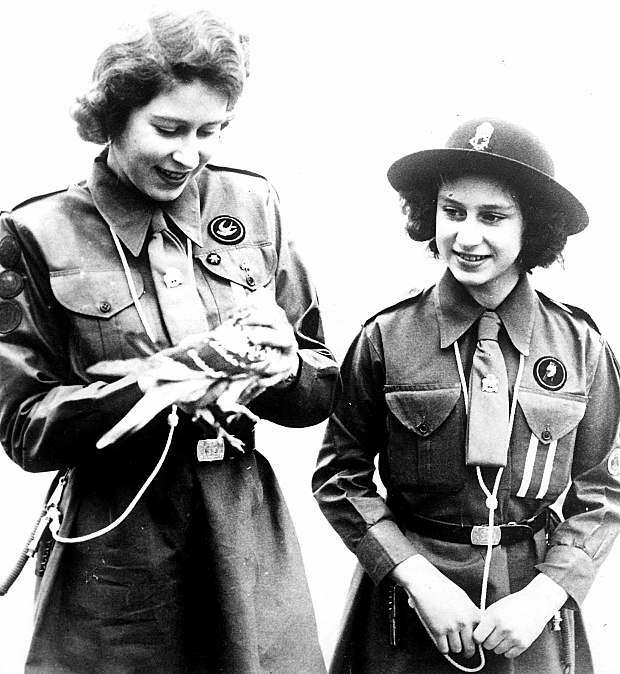 Queen Elizabeth II as Princess Elizabeth with sister Princess Margaret and a pigeon. Photo: Rex Features.